Wheeled shopping baskets can be very useful for taking more shopping with you than you want to carry. 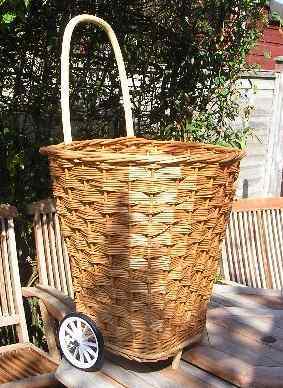 This is the one type of basket on this web site which I don't make. These were made by my father, Gordon Hembrow, in Somerset before he passed away in March 2009. The remaining few of these baskets have now been sold, and there are no more. 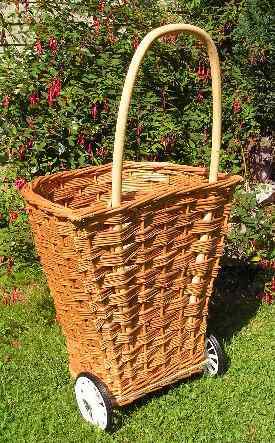 Two sizes were available, both referring to the height of the basket itself, not including the handle. These heights could be 16" or 20". The handles are approximately 36" from the ground. The photos are both of the same 20" tall basket.